Approximately 1,200 tornadoes hit the United States per year and because of their unpredictable and violent nature, tornadoes remain a focal point in extreme weather conversations. In this Teach-Out, you will learn about the frequency of tornadic events both in the United States and globally, the methods used to assess the strength of tornadoes, what research tells us about their origins and structure, and tornado preparedness and response strategies. You will also explore to what degree scientists believe the frequency and/or intensity of tornadic storms are affected by climate change. What is a thunderstorm and how do some become severe? Where are tornadic thunderstorms likely to form? What are the combination of conditions needed to create a tornadic thunderstorm? How can you best prepare for a tornado in your community? Is there any reason to believe that the frequency or intensity of tornadoes is likely to increase in the future due to climate change? 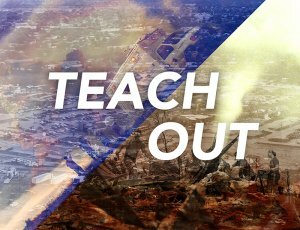 This Teach-Out is part of the Extreme Weather Series, a multi-part examination of the causes of various extreme weather events and to what degree climate change impacts the frequency or intensity of these events. We will also provide participants with strategies and resources to better prepare or respond to extreme weather in their own context.